After a bright start to the spring season, Viero UK has something fresh to add into the mix. Our latest product of the month for April is our Marmorin Extra finish from our traditional lime-based plaster range. With the ability for this to be applied with a pitted effect or a more orthodox smooth polished look, this marmorino product has a range of possibilities. Marmorin Extra has been designed to give you a natural rough texture rather than the smooth polished finish you would usually expect from a venetian plaster. Using different application techniques, it is possible to create a robust, seamless, matt, concrete effect finish for both internal and external environments. It boasts incredible durability. We have recently installed a pitted version of Marmorin Extra throughout the reception area of Ashton’s new office space. One of the team said: “Its pitted texture gives the area a traditional yet modern feel. 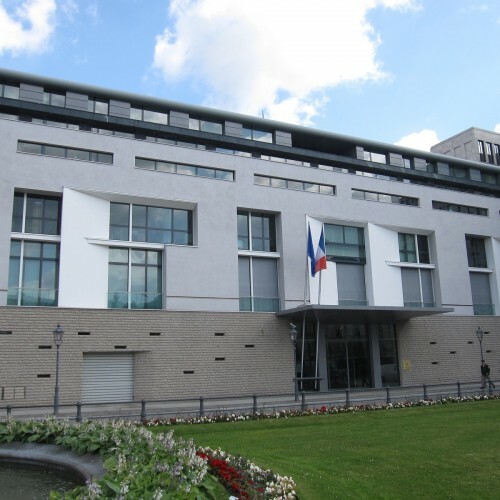 Further afield, Marmorin Extra has also been used on the exterior of the French Embassy in the heart of Berlin. Feel inspired to use Marmorin Extra in your next project? Email enquries@viero.co.uk to find out more.